Eligibility: Open to all swimmers from invited teams who are registered as USA Swimming Athletes. A contestant may enter a maximum of 3 events per session. The meet director reserves the right to adjust warm-up times and/or limit entries in order to comply with Fairfax County Park Authority pool rental agreements. Meet entries will be accepted on a first come first serve basis. It is anticipated that this meet will fill to capacity. PVS and the host clubs along with their meet Directors are committed to the Inclusion Policy as adopted by the BOD. Athletes with a disability are welcome and are asked to provide advanced notice of desire accommodations to the Meet Director and PVS Senior Chairman Riley Eaton at jreaton@verizon.net. The athlete (or the coach) is also responsible for notifying the session referee of any disability prior to the competition. Qualifying times for 9-10 and 11-12 are "No Faster than" J.O. cuts. Diver-0ver starts will be used in the 9-12 sessions, but NOT for 8&U sessions. PARENTS ARE NOT ALLOWED ON THE POOL DECK. 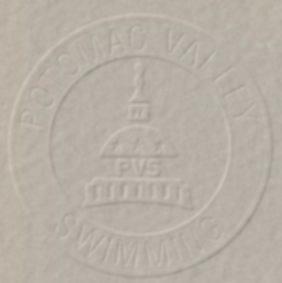 Teams are asked to observe and reinforce USA Swimming and PVS Meet Policy. Specific Heats will have special gift bag for Heat Winners. entry report by swimmer and one report by event. Entries may be sent via e-mail ONLY. Entries must arrive by the due date and time. In the body of your e-mail provide entry numbers (girls, boys, totals). Include contact information ( e-mail, phone, officials contact). Clubs submitting entries that do NOT receive a COMFIRMATION from Bob Hardy should contact him or Victor Abrahamian by e-mail. Fees: Fee for individual events are $5.50. Each club is requested to remit one check to Cover the entry fees for the entire team. Please do not send cash. Late (deck) entries are $10.00 per individual and entries must be submitted no later than 15 minutes prior to the first event of each session. Deck entry only available upon open lane(s) in event. 9-10&11-12 Qualifying Times: No Faster Than (NFT) J.O. No Faster Than ~ N.F.T.